Media Research Center President Brent Bozell appeared with Fox News anchor Neil Cavuto to slam the "obnoxious" double standard in how journalists have covered Chris Christie's traffic scandal in two days, versus the scant number of stories on the Obama IRS controversy over six months. According to Bozell, "It really goes to show you how out of control this left wing so-called news press is." [See video below. MP3 audio here.] Cavuto explained, "The big three networks alone devoted 17 times more coverage to this story in one day, one day, than they devoted to the IRS scandal in six months." An updated analysis my the MRC finds the disparity is now up to 44-to-one. ABC's Jeremy Hubbard Hints at Conspiracy: Did Palins 'Get to' Levi Johnston and Make Him Recant? Discussing Johnston's public apology in People magazine, Hubbard began, "Did they sit him down and-" He broke off and didn't finish the thought. What was Hubbard implying? The answer went unsaid. 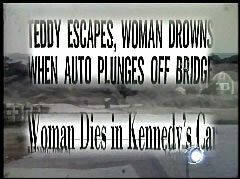 In the early hours of Wednesday, reporter John Donvan narrated a tough, comprehensive look at the life of Ted Kennedy, one that went so far as to assert that the Senator was sometimes "a let down, an embarrassment to his family, to his party, to himself." However, this eight and a half minute segment, which looked into Chappaquiddick, Kennedy’s cheating at Harvard and other scandals, aired at 2:30 (11:30 on the west coast) in the morning, during a special, late night edition of Nightline. A much shorter, sanitized version of the piece was replayed on the August 26 edition of World News With Charles Gibson. It left out the harsh words about being a "failure," the accounts of public intoxication and affairs, all of which were featured in the Nightline segment. After promoting the controversial, religion-baiting film "Angels & Demons" for a combined 19 minutes last week on "Good Morning America," ABC finally featured a Catholic priest to object to the movie. 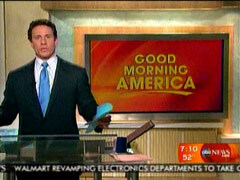 Unfortunately, the interview was relegated only to the network's website, not the ABC morning show. (Considering the four days of fawning coverage to the film's stars last week, this hardly seems fair.) Father Edward Beck appeared on the internet-based "Focus on Faith" to talk to Chris Cuomo and point out the inaccuracies. Beck critiqued the filmmakers behind "Angels & Demons," which falsely features the Catholic Church participating in a brutal massacre of a secret society, asserting that they should be more responsible for "doing their homework, even with a work of fiction." Cuomo bizarrely responded by claiming Beck needed to consider "the atheistic [position], which is, 'It's all fiction.' So, the church doesn't have any right to hold its own truth when it is a fiction in and of itself." He reiterated the disbelievers take, stating, "Anything you say you believe in is based on a fiction, because God is a fiction. So, what's wrong with having a fiction about fiction?"